Purple Plum Fairy: Shop, dine and swipe to Fly for Free with Cebu Pacific's GetGo! 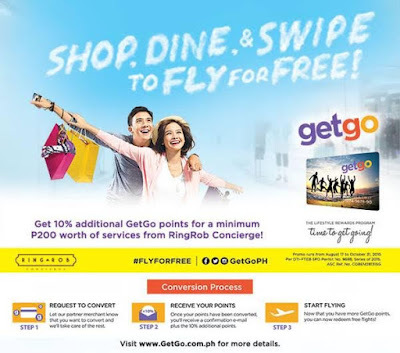 Shop, dine and swipe to Fly for Free with Cebu Pacific's GetGo! Now, more people can experience the joys of flying for free as GetGo, the newest lifestyle rewards program of Cebu Pacific, has widened their roster of bank partners with BDO, Security Bank, and UnionBank. Card holders of these new partners together with existing partners Citibank, Metrobank Card, RCBC Bankard, ZAP and RingRob Concierge can all convert their rewards points to GetGo points. These points can be used to redeem and book free Cebu Pacific flights, locally and abroad. The more people use these credit cards to shop, dine and pay their bills every day, the more points they will earn. Additional GetGo points are also given to those who use their credit cards to fly Cebu Pacific or avail of add-on products such as baggage, insurance and meals. From August 17 to October 31, 2015, cardholders can also get 10% additional points when converting their rewards points from Citibank, RCBC Bankard, Security Bank, BDO, UnionBank, Metrobank Card, ZAP and Ring Rob Concierge. The conversion process includes (1) requesting the partner merchant to convert your loyalty points to GetGo points, (2) receiving a confirmation e-mail plus the additional 10% GetGo points, and (3) flying by redeeming your free flights! So hurry and swipe your way to free flights with GetGo, today! To avail of the GetGo membership and to enjoy more amazing credit card rewards, simply visit www.GetGo.com.ph, click JOIN, fill out the application form, and for only a P150 membership fee, have your personalized GetGo card delivered to your doorstep. To know more about GetGo’s loyalty program, its partners and promos, visitwww.GetGo.com.ph or call +632 71-GETGO (43846). The latest updates are also on GetGoPH's official pages on Facebook, Twitter and Instagram.